Edinburgh, Cramond Island, Cramond Battery, coast battery. View of gun battery engine house from North East showing entrance with steps, ventilators and steel window shutters..
General oblique aerial view centred on the Island, taken from the N.
Scanned image from North West of earlier type of searchlight emplacement with focussing shutters still in situ. 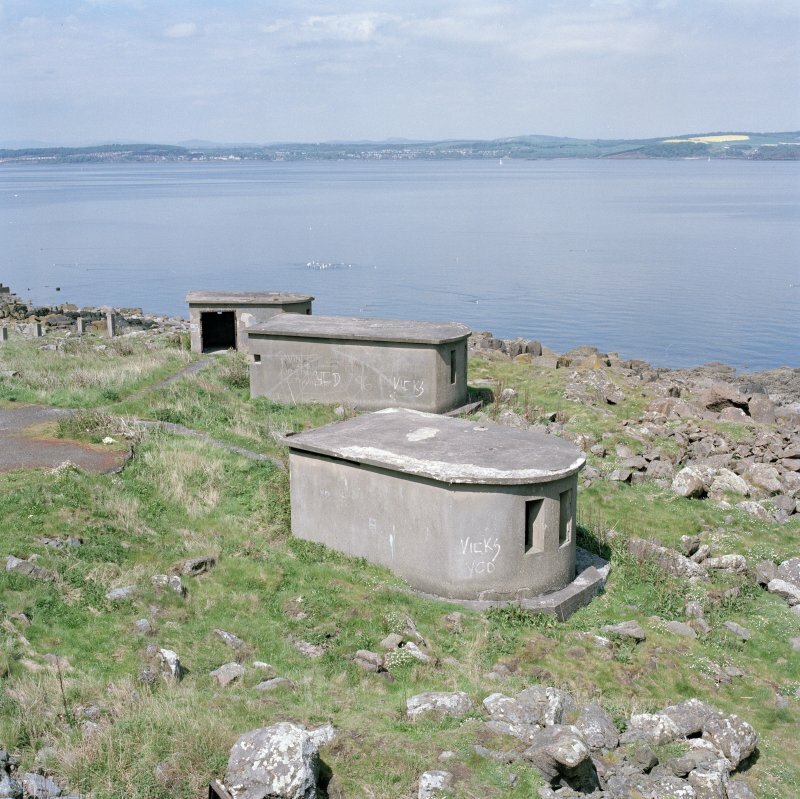 Scanned image of Edinburgh, Cramond Island, Cramond Battery, coast battery, view from south of remains of the gun emplacement (canopy removed). Visible are the holes for the canopy support and an area of reconstruction to the carapace. 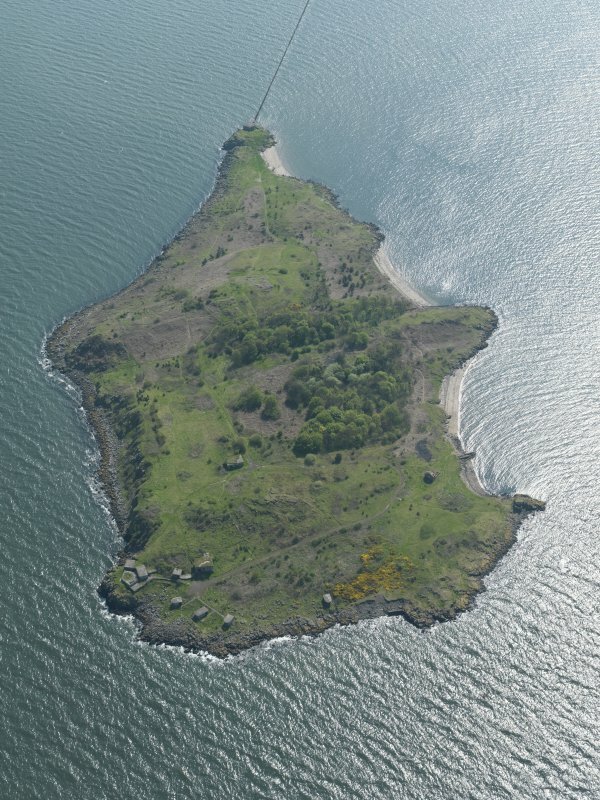 Oblique aerial view of Cramond Island centred on The Binks, taken from the N.
Oblique aerial view centred on the N part of the Island, taken from the E.
Scanned image of Edinburgh, Cramond Island, Cramond Battery, coast battery of general view of the two types of searchlight emplacements from South East. Edinburgh, Cramond Island, Cramond Battery, coast battery. Interior of earlier version of searchlight emplacemen. Detail of light beam focussing shutters and tracking rails. Edinburgh, Cramond Island, Cramond Battery, coast battery. View from south of remains of the gun emplacement (canopy removed). Visible are the holes for the canopy support and an area of reconstruction to the carapace. 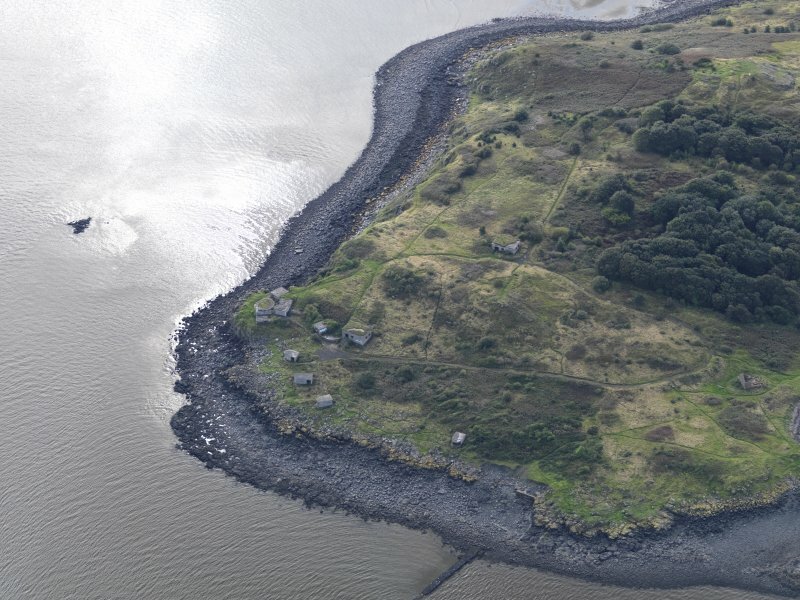 Oblique aerial view of Cramond Island, centred on The Binks. 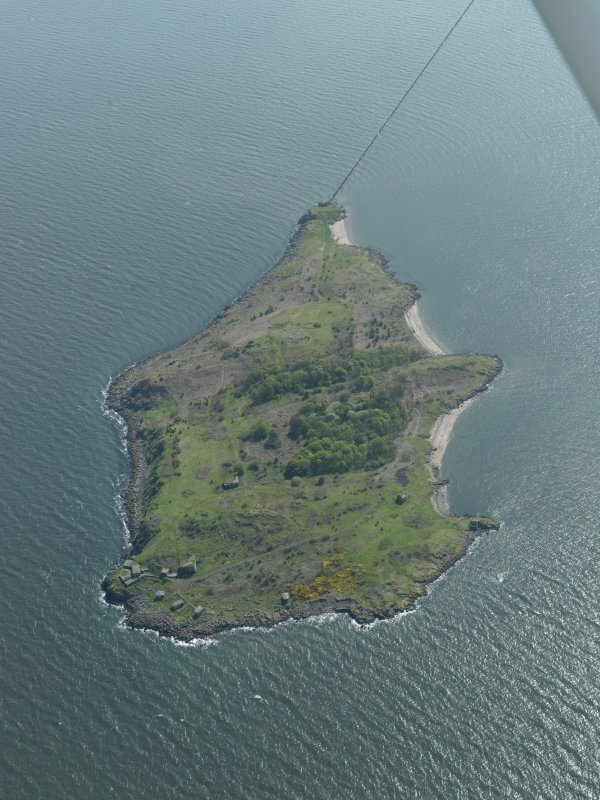 Oblique aerial view of Cramond Island, taken from the SSE, centred on The Binks, taken from the SSE. 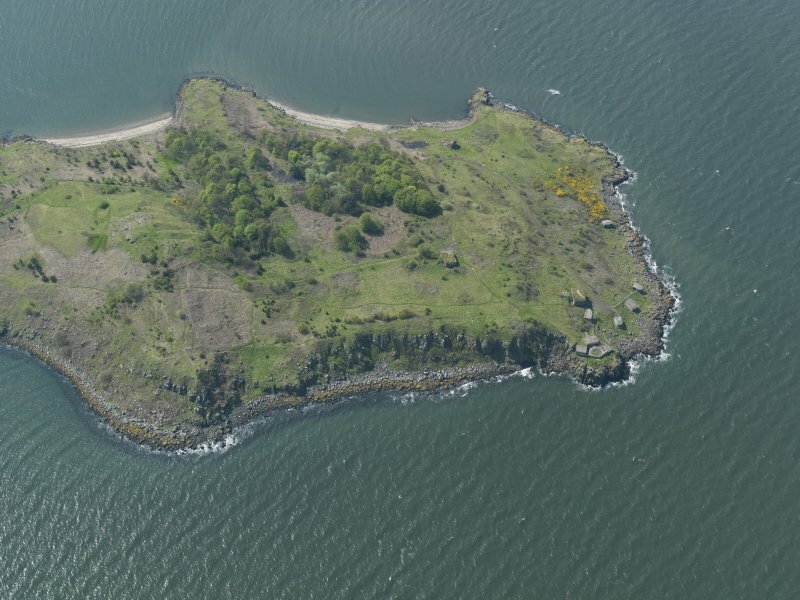 General oblique aerial view centred the Island, taken from the N.
Edinburgh, Cramond Island, Cramond Battery, coast battery. View of later type of searchlight emplacements from South. 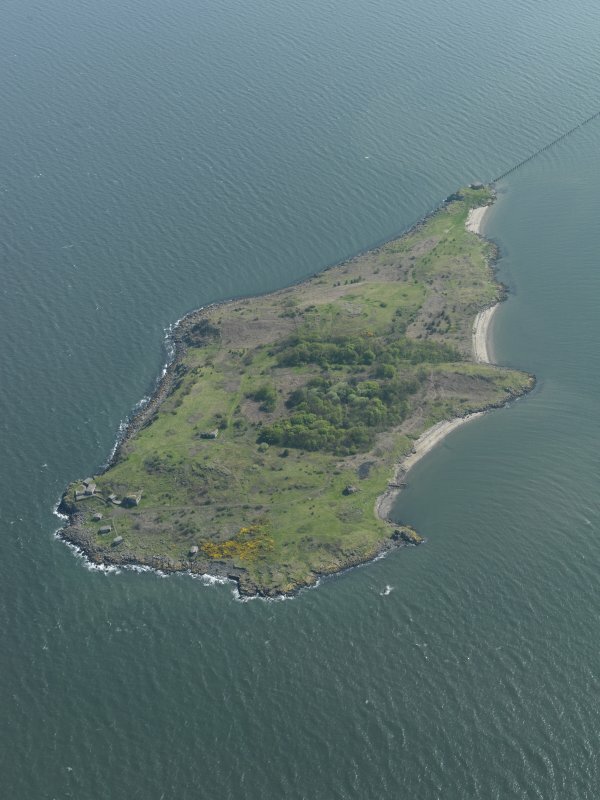 Oblique aerial view of Cramond Island centred on The Binks, taken from the NNW. General oblique aerial view centred on the Island, taken from the WNW. 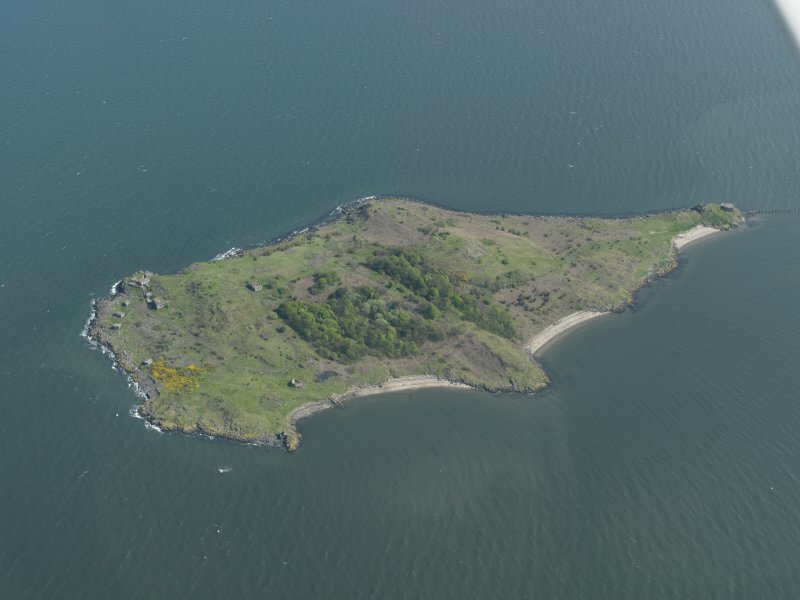 General oblique aerial view centred on the Island, taken from the NNW. Scanned image of Edinburgh, Cramond Island, Cramond Battery, coast battery showing interior of earlier version of searchlight emplacement. Detail of light beam focussing shutters and tracking rails..
Scanned image view of gun battery engine house and magazine from the East. Visible are ventilators and steel framed windows. 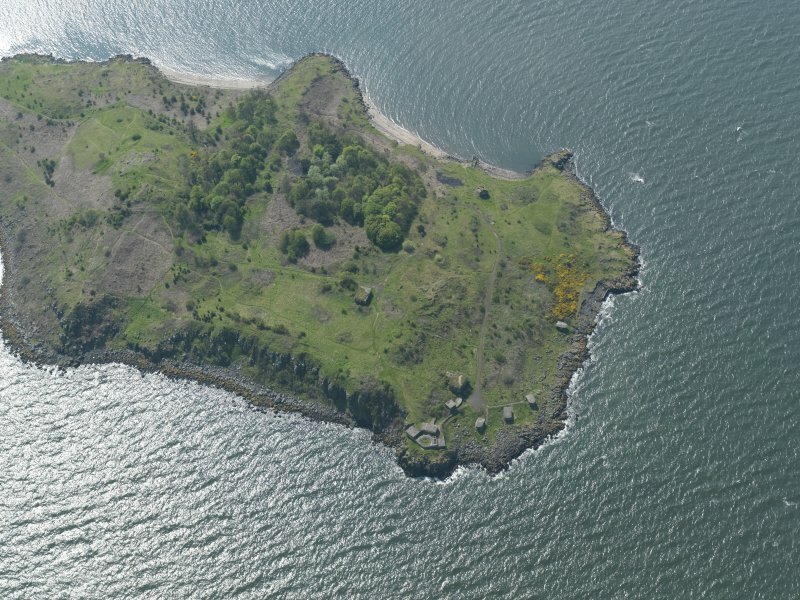 Cramond Island was fortified in 1915 as part of the Middle defences of the Firth of Forth and explicitly to cover the anti-submarine barrier that ran from Cramond to Braefoot, via Inchmickery and Inchcolm islands. The history of the defences of the Forth, as set out in the Fort Record Book of Inchcolm (The National Archives WO 192/108). 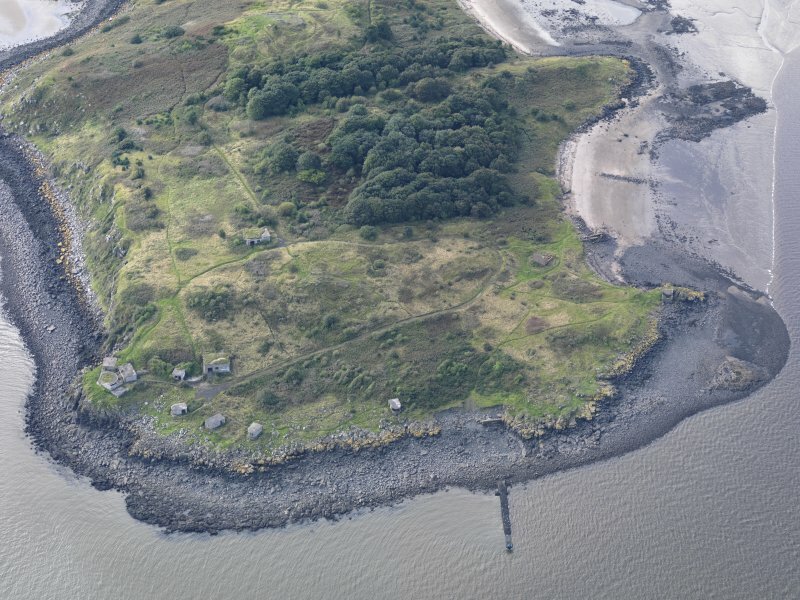 Fourteen 12-pdr guns were supplied to the three islands on the line and of these two were emplaced at Cramond. 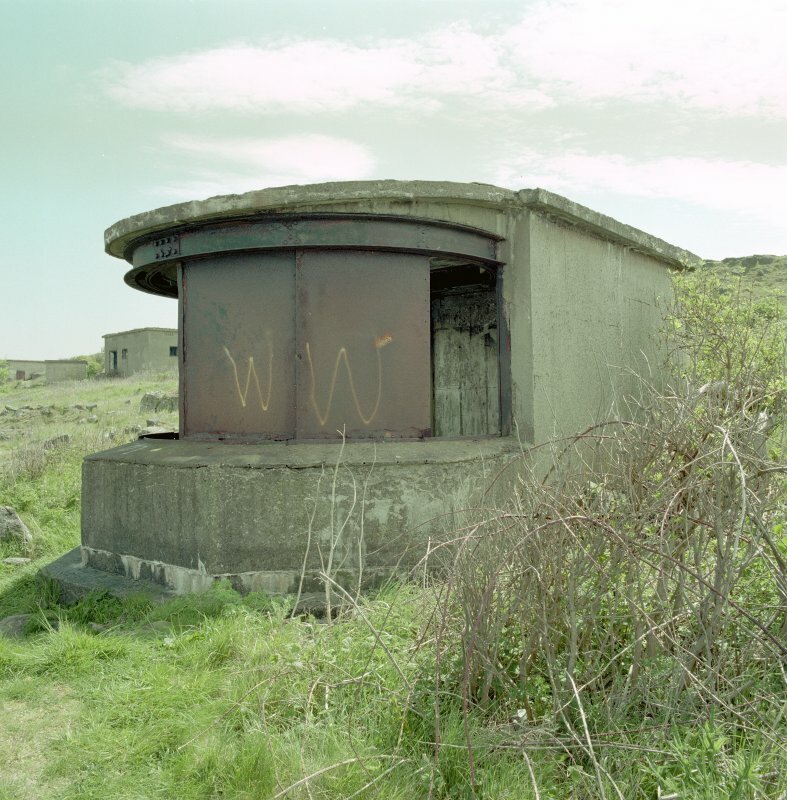 The two emplacements were at NT 19722 78686 and NT 19739 78669. 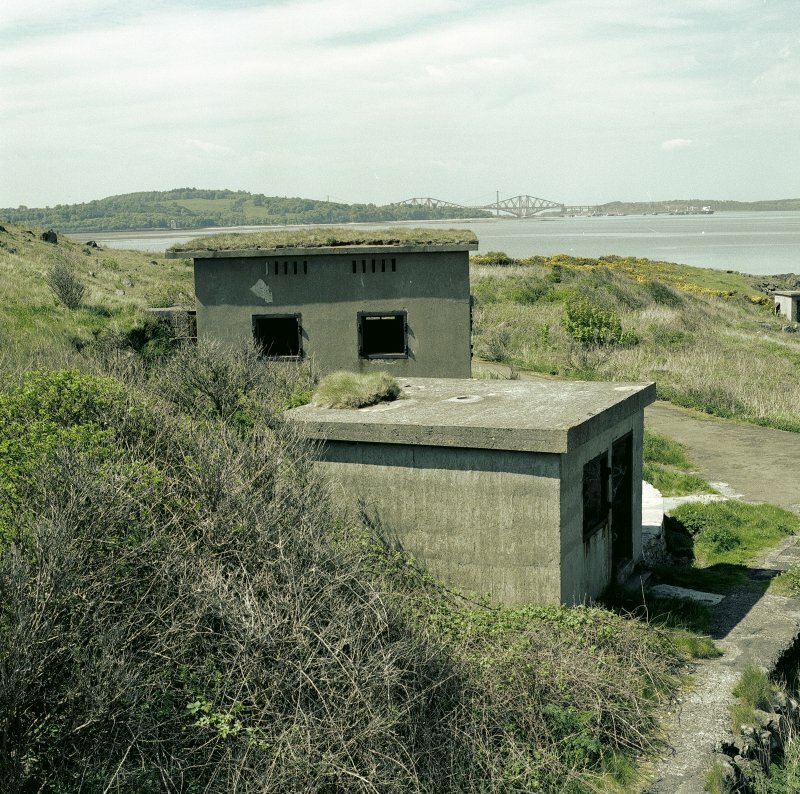 Whereas most of the 12-pdrs were replaced in 1916, when the defences of the Forth were reorganised, the two 12-pdrs on Cramond remained in place until the end of the war. They had been returned to the Navy by 1921. The same 1915 map shows the location of a single Defence Electric Light emplacement at NT 19737 78749. The island was re-armed at the beginning of the Second World War and two 12-pdrs were re-mounted on the original emplacements. Armed by March 1915; 2 x 12 pdr guns in 1918. 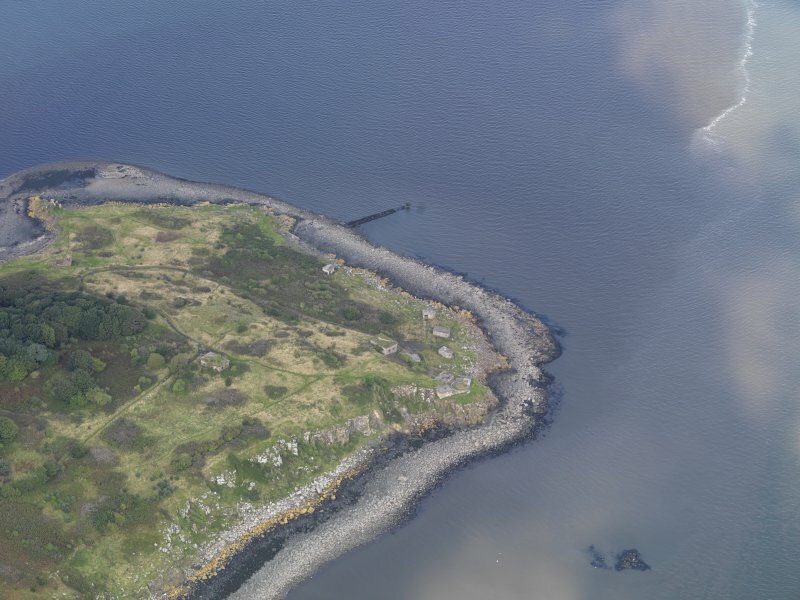 A coast battery situated on the extreme NE end of Cramond Island at the end of a metalled track which originates at the engine house (NT17NE 71.01, NT 1969 7866). 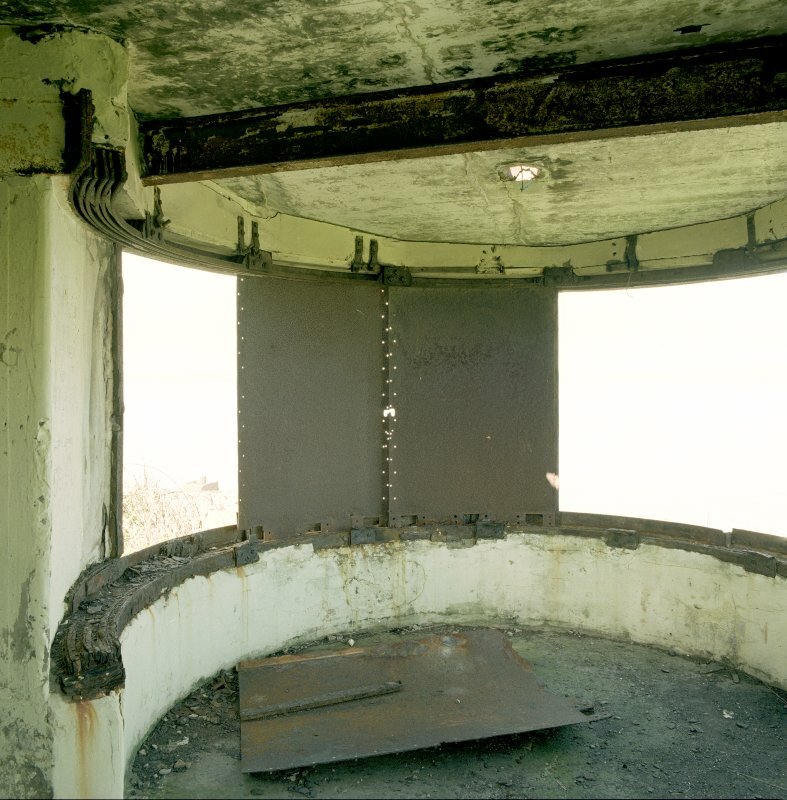 One gun emplacement is extant, though the canopy has been demolished and a further three searchlight platforms lie to the NW, one of which retains its curved metal focussing shutters. Further brick built buildings lie immediately W of the gun position. Gun emplacement, magazine, shelters and engine room (NT17NE 71.01) with three fixed beam searchlights. The director tower has been demolished. 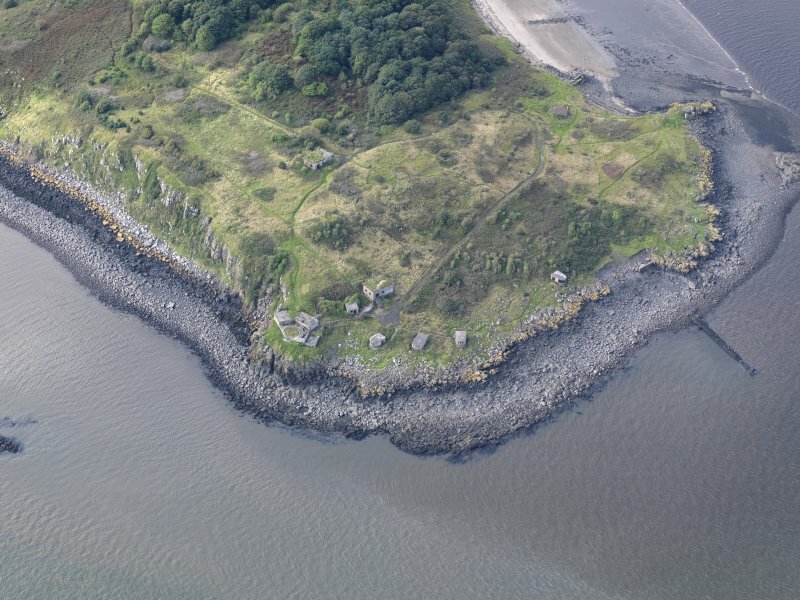 Cramond Island was fortified during World War One, but there is no record presently available of the armaments at that time. 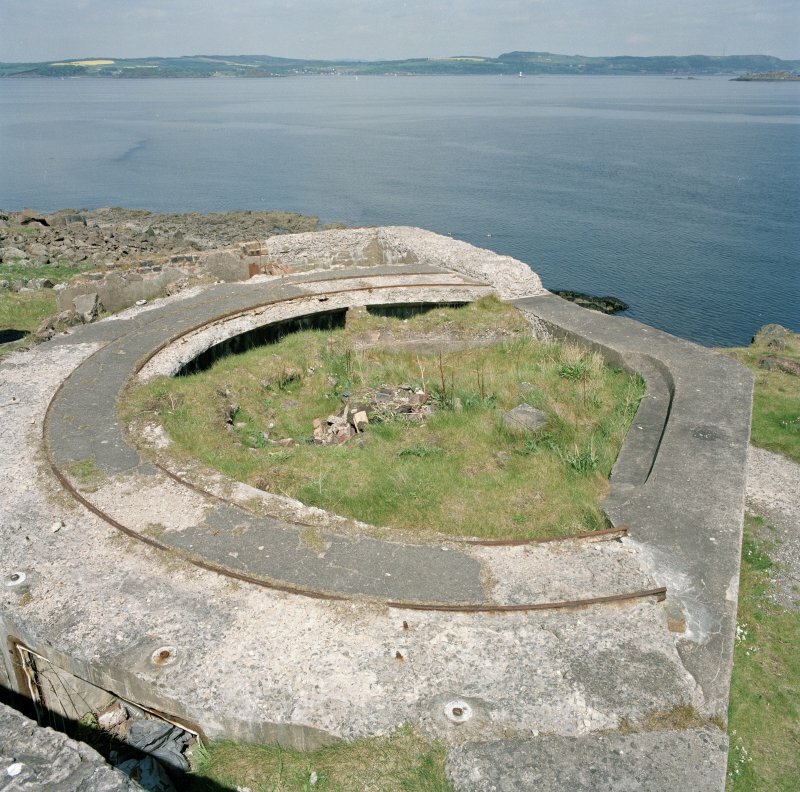 The site was re-acquired by the War Department in the summer of 1939 and by the autumn guns had been mounted on the Dalmeny Battery (NT17NE 71.02). The summer of 1940 saw the arming of Cramond Battery to mount one twin 6 pounder gun. 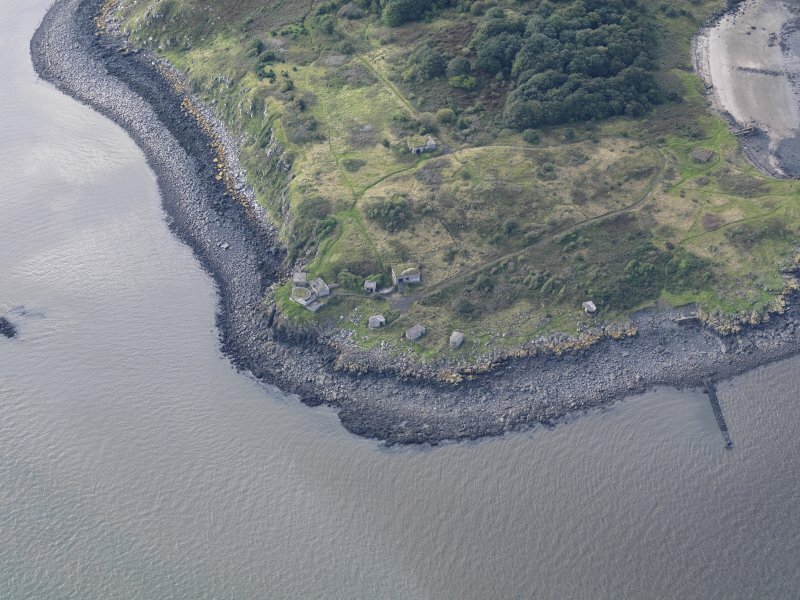 All the defences on Cramond Island were anti-ship covering the channel between the island and Inchmickery and Cramond. J A Guy 1997; NMRS 810/5,49, 54, 57-9; PRO WO 192/253. The two gun batteries along with the associated accommodation camps, engine houses, searchlight platforms and ancillery buildings are visible on post-war RAF vertical air photographs (106G/Scot/UK 117, 5017-18, flown 29 May 1946). Coastal battery, armed in 1915. Records from 1918 show that this battery was armed with two 12 pounder guns, which were intended as a defence against motor torpedo boats. Surviving structures: one circular gun emplacement with metal runners; three elongated D-plan concrete structures with small arms slits to seaward; one elongated D-plan concrete structure with metal shutters on runners facing seawards (coast artillery searchlight); one roofed concrete building 8 by 5 by 2 metres, with raised floor and internal trenches. The site has been vandalised. As these structures were roofed it is likely they were re-used in WW2, as most coastal batteries were retained after 1918. From 1939, batteries were strengthened against aerial bombardment by the addition of roofs. Coastal artillery batteries were abolished in 1956. Lowry 1995, 93-103. Site recorded by GUARD during the Coastal Assessment Survey for Historic Scotland, 'The Firth of Forth from Dunbar to the Coast of Fife' 10th March 1996. 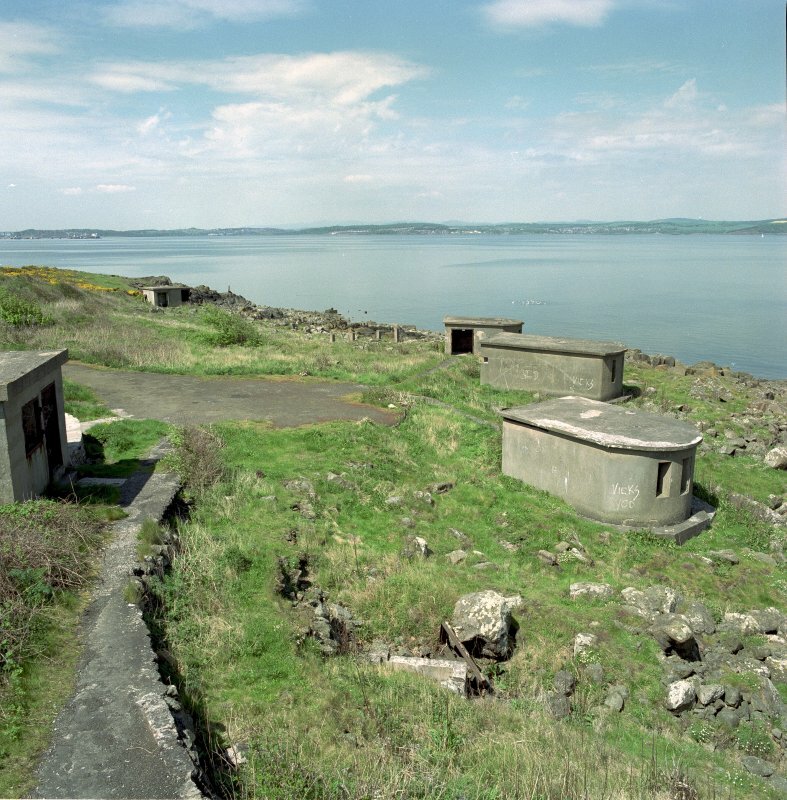 Cramond Island was fortified in 1915 as stated, but not in the position of this battery. It mounted two 12 pounder guns in the 12 pdr battery positions shown in the plan of the fort (PRO - WO78/5164). These guns were removed shortly after the end of the First World War, but replaced in the summer of 1939 by two similar guns from Inchgarvie (not Coastguard Battery as BSM Potter recorded in the Fort Record Book). These guns were re-installed on the original First World War mounts. The emplacements are partially buried under earth mounds but the face of at least one of the concrete platforms is visible, to a height of about 1 metre, from the cliff top. All surviving military structures date from the Second World war and include:- one circular gun emplacement with the metal runners for the shell trolleys; three elongated D plan reinforced concrete structures facing seaward, for wide beam searchlights; one elongated D plan reinforced concrete structure, with its associated metal shutters lying alongside, which housed a steerable concentrated beam searchlight; one roofed reinforced concrete building 8 metres by 5 metres by 2 metres, with raised floor and internal trenches; one roofed, reinforced concrete building. 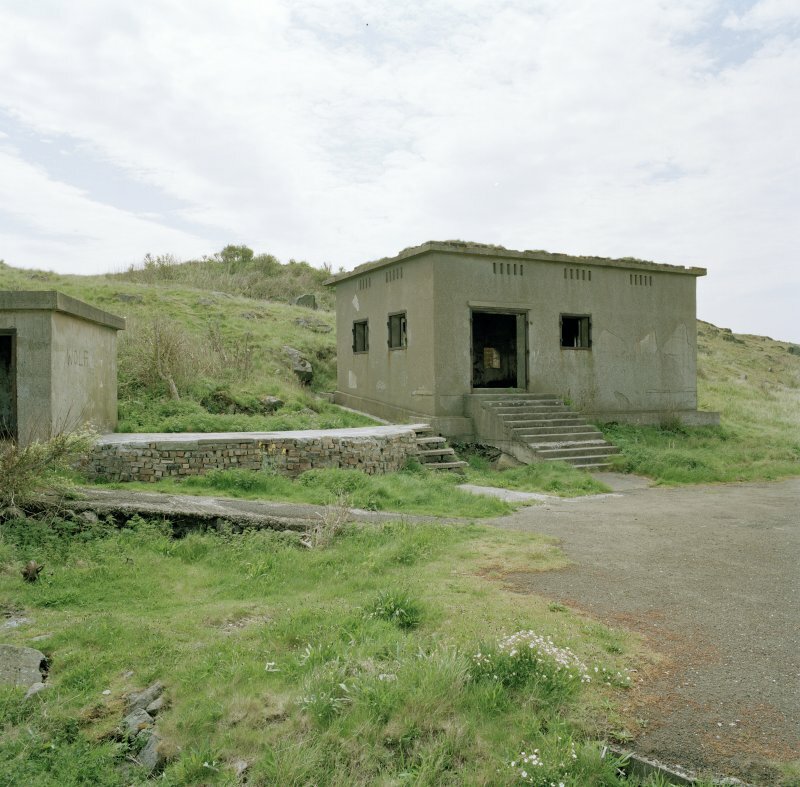 The site was partly demolished by the army when they relinquished their interest in the island in the 1950's and has suffered further recent vandalism. Information via e-mail to RCAHMS from Mr J Dods (Cramond Heritage Society), April 2006.